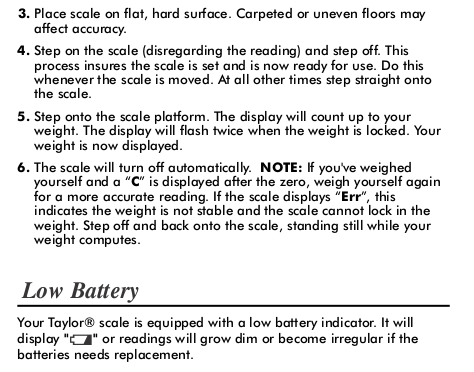 Instructions for Taylor 7405 Scale | Eat Regularly! 1. PRECAUTIONS: Floor must be level. 2. CALIBRATE: Step on scale until displayed weight flashes twice. DISREGARD THIS VALUE. Step off scale. 3. COLLECT DATA: Step onto scale again until raw weight flashes twice.